Where do you go in Perth when you just want a casual meal, where the service is prompt, the food arrives quickly and is exquisite despite the speed, and with a great wine list to boot? La Lola is the only place that comes to mind for me when I need all these boxes ticked. There is of course a catch (nothing in life is perfect after all!) – you can’t book a table for dinner (although you can book for lunch) and will need to be prepared to wait a little while for a table to come free. And unfortunately, they haven’t got a bar for you to sit at to wait for your table over a drink. But it’s well worth the wait. If you’re lucky, you may jag a table just as you turn up to the restaurant, but for those without the requisite patience threshold, there are a couple of things you could do to dramatically improve your chances of getting a table without having to wait: arrive earlier (say just before the opening time of 6pm), or turn up on a school night. Well, I did both, turning up on a Wednesday night at 6.30pm with one of my best mates Mike and his wife Kathleen. We were off to experience a late session of the amazing wonder-inducing, multi-sensory, fully immersive experience that was Oraculos, the red hot sell-out show of the 2012 Perth International Arts Festival. Fully expecting to have to wait, we were pleasantly surprised to discover an empty booth waiting to welcome us as we walked up to the restaurant. The décor is brand new and the seats comfortable. The cuisine is modern Mediterranean. And while the wine list is small, the wines are well selected and there are some old friends to be found, although I am embarrassed to confess that I’ve forgotten what they are. But trust me – they’re good! In fact, I think that this is a great excuse to dine at La Lola again to help jog my memory! We opted for a combination of tapas style entrées, followed by individual mains. 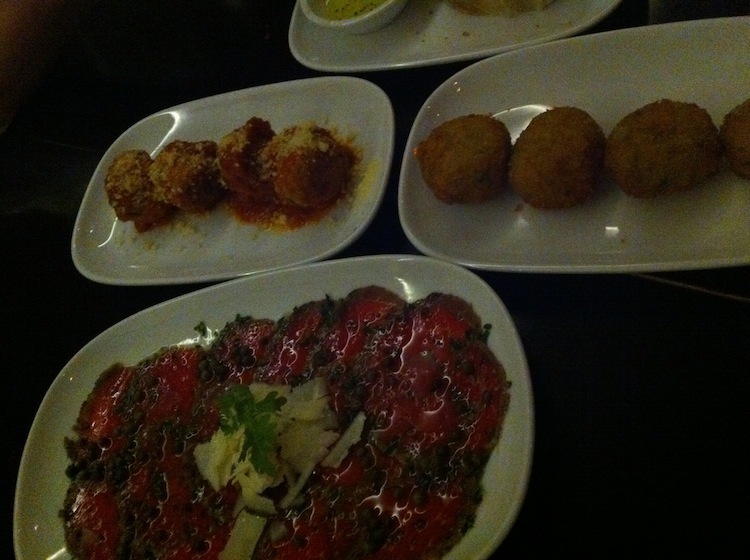 For entrées, we ordered the beef carpaccio, veal polpette (meatballs) and arancini balls. The carpaccio was good quality if standard fare – wafer-thin roundels of meat drizzled with white truffle olive oil, sprinkled with capers and topped with shaved parmesan cheese. The arancini, however, gave me new respect for a dish that has been much maligned because of its prevalent use as cocktail finger food in wildly varying degrees of quality. This arancini, stuffed with spinach, ricotta, silverbeet and gorgonzola was good – for someone who doesn’t consciously order vegetarian dishes (yes this was Kath’s pick), I was very impressed by the flavour and, more importantly for me, the texture – it was just right (Goldilocks standard, of course! ), and is easier to describe by explaining what it’s not: it wasn’t too gluggy, it was moist but wasn’t too wet, it wasn’t too chewy, and not too oily either. And all that flavoursome cheesy goodness! However, the stand-out for me was certainly the veal polpette. Again, very difficult to describe, other than to say that it was quite sublime. Eating it inspired me to start eating meatballs again – even to try to make them at home! 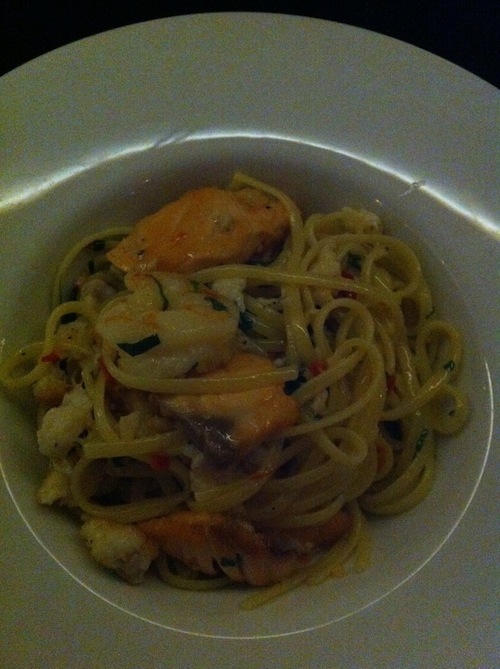 For my main, I ordered a seafood linguine: al dente pasta married with chunks of lusciously cooked atlantic salmon (not dry or chewy at all), prawns and generous morsels fresh crab meant, seasoned with extra virgin olive oil, a bit of chilli, garlic and parsley, although I would swear that I tasted the distinctive flavour of basil too. I helped myself liberally to the roving bowl of cut chillis in olive oil, and was sweating liberally before I was halfway through the meal. Despite the self-inflicted surfeit of chilli, the rich flavours of the dish were clearly and enjoyably present. I didn’t have dessert but stole a bit of Mike’s and Kath’s, although I did succumb to the temptation of a bouchee elephant chocolate – I remember my dad used to bring them home for us kids when I was just a young boy – and it is still a treat today. While these guys would be likely to turn over tables at least once, if not twice, each night, and the small venue was buzzing with cheerful efficiency, there was a very pleasant lack of urgency which allowed us the illusion of lingering over our meals. In other words, a comfortable and cheerful vibe. Nobody tried to hurry us up, or take away unfinished plates, yet when we had finally finished our three courses and bottle of wine, less than two hours had passed, which in my book is pretty quick for three courses of dinner. Then again, we did have a show to catch after all.